One of the trendiest things these days is the whole “minimalism” mindset. Thanks to Marie Kondo, people are constantly trying to spark joy while ridding their lives of clutter and excess things. But when it comes to trends, not everyone is always on board and that’s okay too. I personally strive to keep things basic and simple, but we are human and things happen! However sometimes we DO need a system of some sort to help us maintain our things without accumulating too much stuff. After all, this stuff just gets left behind anyway and most of it never gets worn or used. We have a tendency to hold onto things that we think we will need one day. Don’t worry, I am guilty of it too. And truth be told, the way trends constantly make their way back it really would be smart to just hold onto EVERYTHING, ha! But sorry, I simply can’t handle that! Below are some ideals to have in place to help you maintain what is coming in and going out of your home. Think of it as a very laxed way to live a little more simply! You can adapt one or all of these to help control the flow of crap making its way into your precious home. Be grateful for your crap, as it likely served you well. But go ahead and make room and enjoy less! Less stuff always leads to less anxiety, less anger, less overwhelming and more joy (at least for most of us!). For every piece of clothing that you buy, give something away. I first heard this from a favorite blogger of mine, Arrows and Bow, and I think this is BRILLIANT. Now each every time I purchase some clothes, I find some to giveaway. This is a very productive task for me because I have a tendency to hold on to some pieces of clothing because I think I will wear it again. Considering how often I purge through my closet, it’s nice when I finally get the courage to get rid of something. It’s so freeing! Allow yourself just one pile of clutter. We have one pile of clutter in our home and that’s usually some sort of paper/mail/school work stack. Some days it is on my table, other days on my desk but most often it’s on my kitchen counter. This stack drives me crazy but it’s the only stack I have and I try to make it vanish once a week! Get rid of food boxes. Storing snacks, breakfast items and more in bulky boxes takes up a ton of room in the pantry and sometimes makes things less visible. You can’t tell all that you have if there’s stacks of boxes hiding other boxes. Take things out of the boxes and place them in clear bins, baskets, or clear canisters. This makes storage more appealing, more practical and allows for more space. Cut corners where you can. This may not necessarily take up “space” but any bill, subscription or obligation takes up mental space. If you don’t watch cable much then get rid of it and rely on movies and streaming. If you don’t use a land line, don’t pay for it. If you use essential oils, then start taking on DIY projects for simple things like chest rubs, lash boost and so on. Not having to run to the store constantly and spend money is a great way to simplify! Simplify under the sink cabinets. Under the sink kitchen and bathroom cabinets tend to be the worst in most homes. Usually they are full of products, cleaners, half empty bottles and so on. Make it a goal to go through this every few months and toss all of the almost empty, expired and hardly used items. Buy toys that will last. Deep down inside, I am a toy snob. With the exception of Barbies and Little People, I am a total toy snob who prefers classic, wooden toys that will last a lifetime. Is that what we always have? No indeed. But I have learned that cheap, temporary toys just really aren’t worth it. Those only make their way here by gift or school and those make their way quickly after they’ve become “forgotten.” Having a bunch of little pieces of toys lying around drives me somewhat crazy. If it doesn’t have a real purpose, doesn’t get played with and doesn’t belong to something then off it goes. Remove things temporarily. Ever feel like one room has too much stuff? Or perhaps that piece of furniture you have really isn’t so needed? Remove things temporarily and store them in a shed or basement to see how your home feels without it. Sometimes this makes a huge change and you feel like there is more room! I do this quite a bit and love the practice to help me decide what stays and what goes. Put the appliances below. I have tried having my kitchen various ways, which included having my kitchen appliances out where I could see them and use them easily. This however just doesn’t work for me because I can’t handle the clutter (especially in an old galley style kitchen). Place your appliances in easy to reach cabinets and it will save you space on your counters! These are just simple practices to help you along the way. There are many more methods to take including donating toys regularly and using the Marie Kondo method to purge through old clothes. 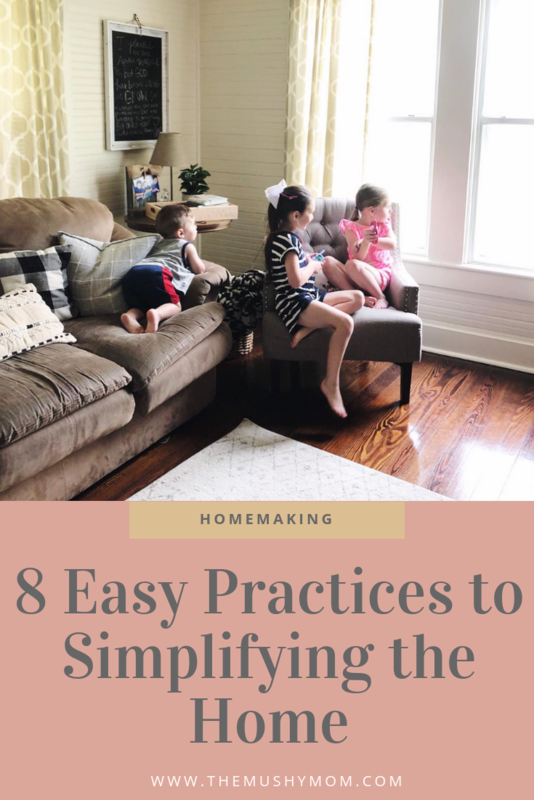 Also check out our Creating a Simple Home Post! I recently removed that LOVE sign above the doorway because it felt like too much. After temporarily removing it, I have decided to keep it down for good.